The National Museum of Contemporary Art, Athens (EMST) presents 39 New Acquisitions by 33 artists that were included in the Museum’s collection from 2014 to 2017. A year after the partial operation of the Museum and the opening of its temporary exhibition spaces, the first selection of its New Acquisitions (2014 – 2017) marks the enrichment of the collection and the beginning of a new dialogue with the greater cultural and artistic production inside and outside EMST and brings the Museum closer to the opening of its permanent collection spaces. 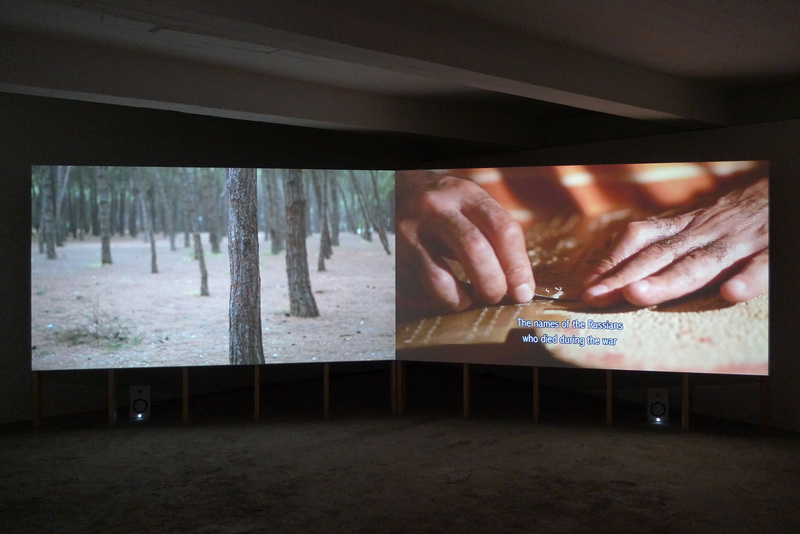 Eleni Kamma's work Play it, Emin: Walking along the Russian Monument at Ayastefanosuses (2014) serves as a point of departure for the actual historical event which signified the official start of national cinema in Turkey in 1914 and whose filmic documentation is lost. 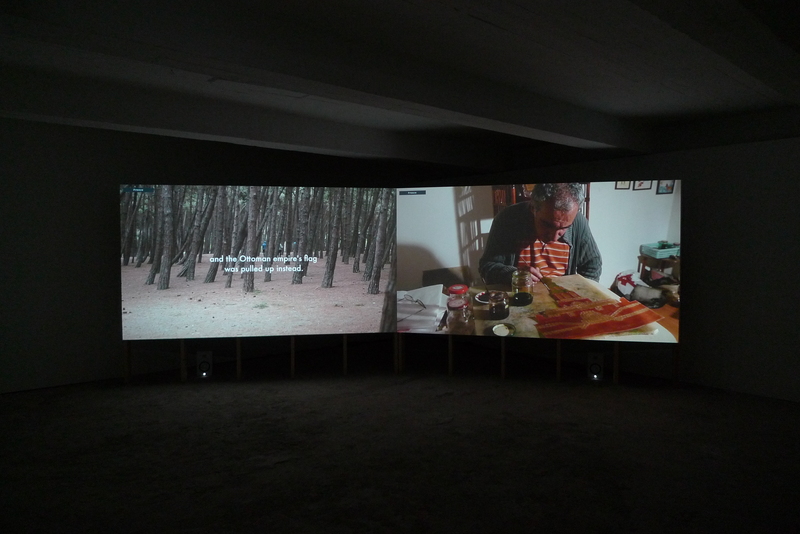 Kamma commissioned Karagoz master Emin Senyer to animate the demolition act of the non-preserved film, based on the following existing information-material; three photos documenting the demolition and a description of the event by two different sources; the lieutenant-demolisher’s personal memoirs and newspapers’ announcements. On the left screen, the camera moves along the actual location (Florya, Istanbul suburb) where the destruction of the monument took place 100 years ago. 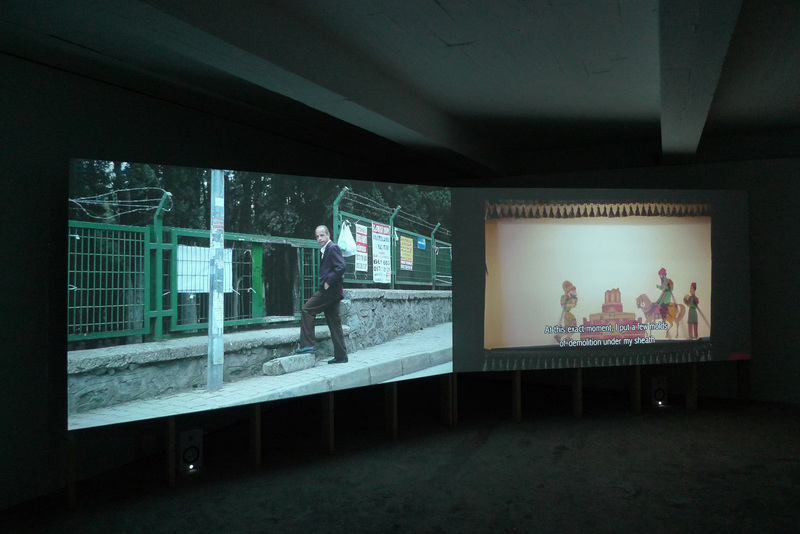 On the right screen, the process of the building up and the rehearsal of Emin Senyer’s shadow theater reconstruction of the demolition act takes place. The work was shown in Kamma's solo exhibition Oh, for some more Amusement! at Netwerk Aalst (BE, 2015). EMST, along with its intensive activity in Greece and abroad and the resolution of administrative issues that will soon lead it to the complete opening of its spaces, has expanded its collection by 150 works, reaching the total number of 1150. With long-term loans, generous donations and some acquisitions, the EMST Collection completes its existing sections with news axes and new topics. In this way the Museum “opens” its door to synergies with other international Museums, in the framework of the series EMST in the World, which for a year now has designated the Museum’s intention for extraversion and constant expansion of its “borders”, counting two exhibitions already, as well as with other individual activities. Movement, forced and violent, fear, humanitarian, social and economic crisis that urges alternative ways of dealing and managing them internally and collectively are themes which the works presented in the exhibition deal with, having a dialectical relationship with what happens in the difficult times we live in. Transculturality and interaction with the audience were and always will be aspects of an “open” museum, transforming it into a living organization, a platform for culture, dialogue, research and production, as well as of experiential knowledge and entertainment. It regards a constant redefinition of the role of a Museum of contemporary art and a constant dialogue with its era and its audience. At the same time, at the temporary exhibition space of the Museum on the Ground Floor, the interactive art project Face Forward … into my home, that was inaugurated a few days ago, is presented. The project is realized in collaboration with UNHCR, the UN Refugee Agency, and funded by the European Commission. The necessity of the social role of the Museum and its active participation in top humanitarian and social issues, such as the one with the refugees, converse in many ways with the works of the Museum’s collection. EMST overcomes obstacles with the assistance of the State, artists, donors, friends and its audience and it is a living example of the actualization of optimism, with its decisive turn towards the world.